Plants sprouting in the burnt plain. Less than ten days after the A-bomb was dropped on Hiroshima, World War II came to an end. Hiroshima had been completely destroyed by the A-bomb, but gradually electricity, transportation, and other functions were restored. The people collected any unburned materials they could find and began rebuilding their homes and their lives. After the atomic bombing, rumour had it that nothing would grow in Hiroshima for 75 years. Then, when red canna flowers became the first to bloom in the charred rubble, they were a tremendous source of courage and hope. Eventually, Hiroshima residents who had evacuated to the countryside and soldiers who had been away fighting the war came back, and Hiroshima started its long journey toward recovery. 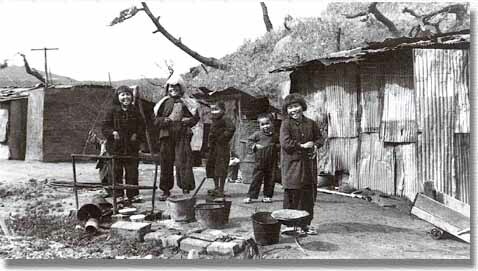 They lived in humble dwellings; a few boards, with sheets of tin for walls and a roof. They didn't have enough food to eat or clothes to wear. And yet, free from the constant fear of air raids, free to sleep through the night, and free to play like kids, children quickly recovered their zest for life.